A frame is a container that holds graphics, text, and shapes. There are three types of frames: unassigned, graphic, and text. The unassigned frame is useful for adding fill and stroke color to a layout. 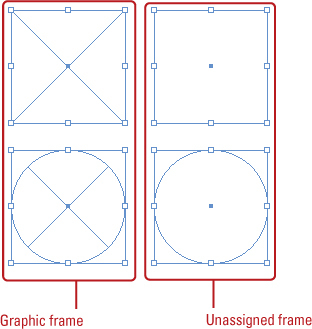 You use the Rectangle, Ellipse, and Polygon tools to create unassigned frames, while you use the Rectangle Frame, Ellipse Frame and Polygon Frame tools to create a graphic frame. A dot appears in the middle of an unassigned frame, while diagonal lines appear in a graphic frame. You can create shapes using unassigned or graphic shapes. In addition to creating a polygon shape, you can also use the Polygon Frame tool to create a star shape for type. You can drag to create a frame box to the size you want using the tool tip which displays width and height. If you need a frame box to be an exact size, you can click a blank area with the Rectangle and Ellipse tools or set width and height settings on the Control panel. Select the Rectangle or Rectangle Frame tool or select the Ellipse or Ellipse Frame tool on the Tools panel. To create a frame to an exact size, click a blank area, specify the width and height you want, and then click OK. Drag to create a rectangle or elliptical frame the size you want using the tool tip width and height. Draw from the center. Hold down Alt (Win) or Option (Mac) as you drag. Constrain to Square or Circle. Hold down Shift as you drag. You can show or hide frame edges. Click the View menu, point to Extras, and then click Show Frame Edges or Hide Frame Edges. Double-click the Polygon or Polygon Frame tool on the Tools panel. Enter a Number of Sides value for the polygon. 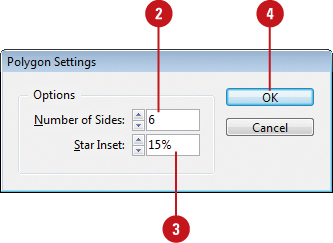 Leave the Star Inset value at 0% to create a polygon. Drag to create a polygon frame box the size you want using the tool tip width and height. As you drag, press the Up or Down arrow keys to increase or decrease the number of sides. Use the Alt (Win) or Option (Mac) key as you drag to draw from center, or the Shift key to draw a proportional shape. Enter a Number of Sides value for the star. 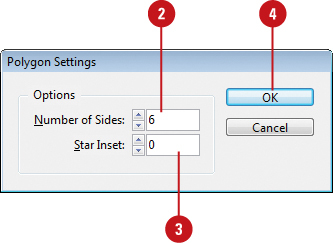 Enter a Star Inset value. The higher the amount, the sharper the points. Drag to create a star frame box the size that you want using the tool tip width and height.